In elementary school it’s important….but for middleschoolers, the summers are really heating up — and I’m not referring to the weather. Summer learning loss for middleschoolers? Summer learning loss for middle schoolers is a big deal. Did you know that according to the National Summer Learning Association, the summers before and after middle school are some of the most important summers of a young person's academic career? And here’s another one that will really amaze you: The ACT (one of the tests students take to see if they’re ready for college) states in their research “the academic level a student reaches in eighth grade is more important in predicting success in college and career than what is achieved in high school.”* So — those foundational skills need to be there by the end of eighth grade, especially if your student is college-bound. 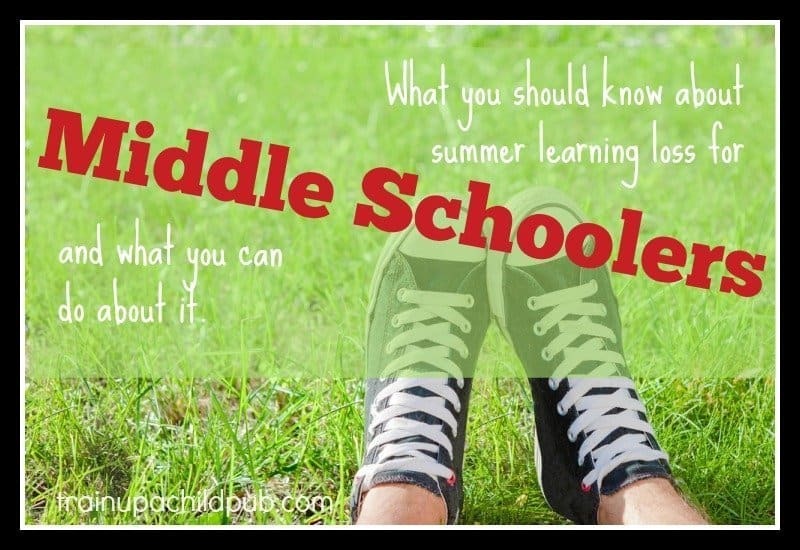 What can I do to help summer learning loss for my Middle School student? The easiest thing to do is just to to keep doing math over the summer. That might mean finishing the book your student was working on last year if it is unfinished, or beginning next year’s level early. Or it may mean doing something else to review skills already learned, or work on solidifying skills that are not quite “sticking” before more complicated skills are taught next year. My very favorite math review books are the Key to Fractions, Key to Decimals, Key to Percentages, etc., series by Key Curriculum Press, available at Christianbook.com and Amazon.com. I love this series because the explanations are clear and they’re practical. Instead of just worksheets (and you know I hate worksheets), they use real-life applications. Depending upon what skills you want to review and how solid your student’s math skills are, I would look through the book descriptions and decide what your student would benefit by reviewing. At Christianbook.com you can see the complete table of contents which will help you best assess where you student might need review. Book 1 “Key to Decimals begins with basic concepts and operations on decimals. It covers real-world uses of decimals in pricing, sports, metrics, calculators, and science. Key to Decimals’ success-oriented approach builds confidence and independence.” Book 1 focuses on the basic concepts. Just like your younger children, middle schoolers need to keep reading daily or almost daily to keep their edge. Thirty-45 minutes a day of free reading will be enough to keep their skills up, especially if you encourage your student to sample a little more variety than he may have read in the past. For example, you might help him alternate between books in different genres: historical fiction, adventure, mystery, biography, science fiction, non-fiction. You could always compromise and have him read something you helped pick out for the first half of reading time, then read whatever he wanted for the second half. If you get stuck, let me know in the comments and I’ll post some ideas of our favorites books in a few different genres. Then you take a look. You don’t need to mark all of her spelling and punctuation errors — just put on the top of the paper how many you found of each and let her try to find them herself. You don’t have to correct everything that your student writes. But if you find the same types of regular errors in her work, it would be helpful for you to address them, especially if this is the summer before 8th grade. Make sure to have a good grammar reference on hand to help both of you. You can see some I recommend here. Writing hint for a reluctant writer: Have him get ready to write, and then tell him you are going to set the timer for 15 minutes and he is not allowed to think about spelling, punctuation or grammar — he is just to write as much as he possibly can about the experience he’s writing about and has to stop when the timer goes off. There’s something about that timer that helps get the words onto the page! He can clean it up and organize it another day, also for 15 minutes, if need be. Incorporate different forms of writing into the summer, as well. Maybe keeping a prayer or other journal, lists of things that your middleschooler wants to do over the summer, letters to Grandma or others, or responding to a writing prompt that you provide will appeal to your student. Variety always makes things more interesting. I hope this sparked a few useful ideas for your middle school student! If so, please tell me in the comments what you liked best! *ACT. (2008) The Forgotten Middle:Improving Readiness for High School. Iowa City, IA. In part I of this series we talked about most kids forgetting about 1-2 months in math computation skills with not as much but still quantifiable losses in reading and other language arts skills during the summer. If you have preschoolers through elementary school students, you’ll want to take a look at that post here. Part III of the summer learning loss series is a must-read if you have high school students, especially if they are rising 9th graders! Excellent post, Dana! If parents just chose one of these areas to focus on during the summer, the impact would be relevant. I think students are more likely to read, but much less likely to write. The value of just keeping a summer journal and self-editing can be significant. Thanks for sharing this valuable post! Great info., as a former teacher I sure wish parent really understood it is worth the fight! Hi Rayna, thanks for adding a comment from your experienced perspective!